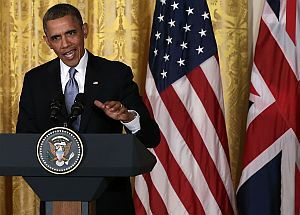 By Becky Bowers, Louis Jacobson on Wednesday, May 15th, 2013 at 3:27 p.m.
President Barack Obama speaks during a joint news conference with British Prime Minister David Cameron in the East Room of the White House on May 13, 2013. House Republicans held hearings last week on the 2012 attacks on a diplomatic outpost in Benghazi, Libya. That's renewed a war of words between members of Congress and President Barack Obama. Here's the history: Diplomatic workers staffed a temporary residential outpost in the Libyan city after the death of dictator Moammar Gadhafi. On a night the U.S. ambassador was visiting from the capital in Tripoli, armed Islamic terrorists attacked, setting a toxic diesel-fueled fire that killed the ambassador and a colleague. Americans then drove, chased by attackers, to a nearby annex, where a mortar attack in the morning killed two security contractors. By noon, hasty scrambling by the American and Libyan governments got U.S. workers to safety in Tripoli, along with their four dead comrades. That "annex" was a compound used by the CIA. So, while we’ve seen unclassified reports from a State Department accountability review board, a Senate committee and some House Republicans, and watched testimony before Rep. Darrell Issa’s House committee last week — there’s a layer of secrecy that daunts diplomats and lawmakers alike. We've fact-checked several new claims this week. On May 6, 2013, Rep. Jason Chaffetz, R-Utah, told Fox News that more could have been done that night. "We had people that were getting killed, we had people who are willing to risk their lives to go save them and somebody told them to stand down." Chaffetz said the order was "as sickening and depressing and disgusting as anything I have seen." But the order to keep special forces in Tripoli came after the deaths in Benghazi had already occurred. The mortar attack was over at that point. We rated his statement False. On May 10, Obama's press secretary, Jay Carney, defended the administration against renewed charges that United Nations Ambassador Susan Rice had downplayed the possibility that extremists were involved in the attacks soon after it happened. "Susan Rice, when she went out on the Sunday shows using the very talking points that we're discussing now, talked about the possibility that we knew that, or believed based on the intelligence assessment, that extremists were involved ... Ambassador Rice, in those shows, talked about the possibility that al-Qaida might be involved, or other al-Qaida affiliates might be involved, or non-al-Qaida Libyan extremists (might be involved), which I think demonstrates that there was no effort to play that down." We pulled Rice's comments and found Carney's recollection was not accurate. We found that Rice barely mentioned the potential role of al-Qaida or one of its affiliates, and she urged caution about jumping to conclusions on the one occasion in which she did. We rated Carney's comment Mostly False. On May 13, President Obama said that the facts behind the attacks had been thoroughly investigated by an independent review board. "Over the last several months, there was a review board headed by two distinguished Americans, Mike Mullen and Tom Pickering, who investigated every element of" the Benghazi incident, he said. Actually, the review board did not look at every element of the incident. It looked at most of the security matters involved, but it didn't look at who conducted the attacks or at the administration's public comments in the days following. We rated Obama's statement Mostly False. Finally, we'll look back to an attack made during last year's presidential campaign. Republican candidate Mitt Romney made the charge in a debate that President Obama waited two weeks to call the attack in Libya "terror." We found that Obama did use the word "terror," but that it still took many days for the administration to fully characterize the attack as the work of a terrorist group. We rated the claim Half True.